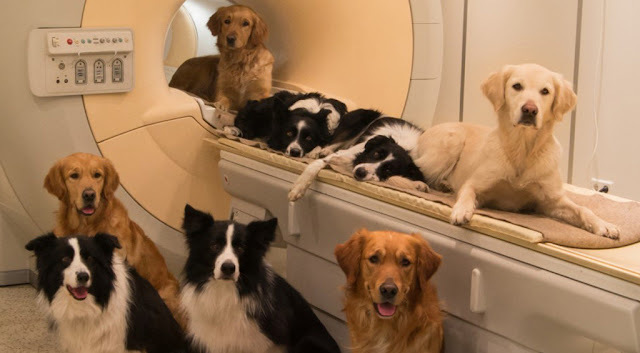 By placing dogs in an MRI scanner, researchers from Hungary found that the canine brain reacts to voices in the same way that the human brain does. Emotionally charged sounds, such as crying or laughter, also prompted similar responses, perhaps explaining why dogs are attuned to human emotions. The work is published in the journal Current Biology. The full article is @ BBC. Eleven pet dogs took part in the study; training them took some time. "We used positive reinforcement strategies - lots of praise," said Dr Andics. "There were 12 sessions of preparatory training, then seven sessions in the scanner room, then these dogs were able to lie motionless for as long as eight minutes. Once they were trained, they were so happy, I wouldn't have believed it if I didn't see it."